Dead Car Battery? What Do You Do Now? When you go out, get in your car, and it clicks but the engine won’t turn over, the most likely reason is that your battery has died. The lights and radio won’t come on – just a few clicks when you turn the key. Batteries in a car can die due to a number of things. The thing is, if you happen to be on the road when something like this happens, you can find yourself in a sticky situation quickly. Because things like this – and flat tires – happen, this is something that everyone who drives a vehicle should know how to fix. So, what happens when the battery in your car dies and why does it happen? Why Does the Battery in a Car Die? You may have left the interior lights, stereo, or headlights on when you last turned the car off. You may have left a phone or other device plugged in and charging when the car was turned off. The air conditioner or heater was turned on while the car wasn’t on. Temperatures that are very low. The alternator’s voltage regulator stopped working. Your battery has not been maintained well. The car hasn’t been started in a while (like longer than a few weeks). Just because the battery died, that doesn’t necessarily mean that it needs to be replaced. 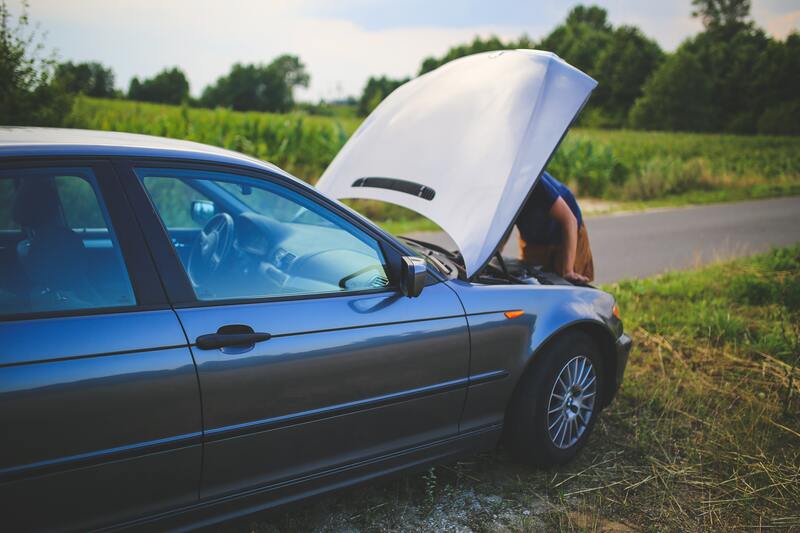 Typically, the answer to the question posed here today – What do you do when your car battery dies? – is simply to jump start it and make sure it charges. There is an upside to having a car battery die. It is that you typically don’t need a lot of tools and gadgets to fix it. Most of the time, all that will be necessary is either another running car or a battery charger, and a set of jumper cables. Everyone who owns a car should at least have a set of jumper cables in the trunk of their car because situations like this can happen to anyone at any time. As far as another running vehicle goes – you might need to call a friend or get assistance from another driver in the area. 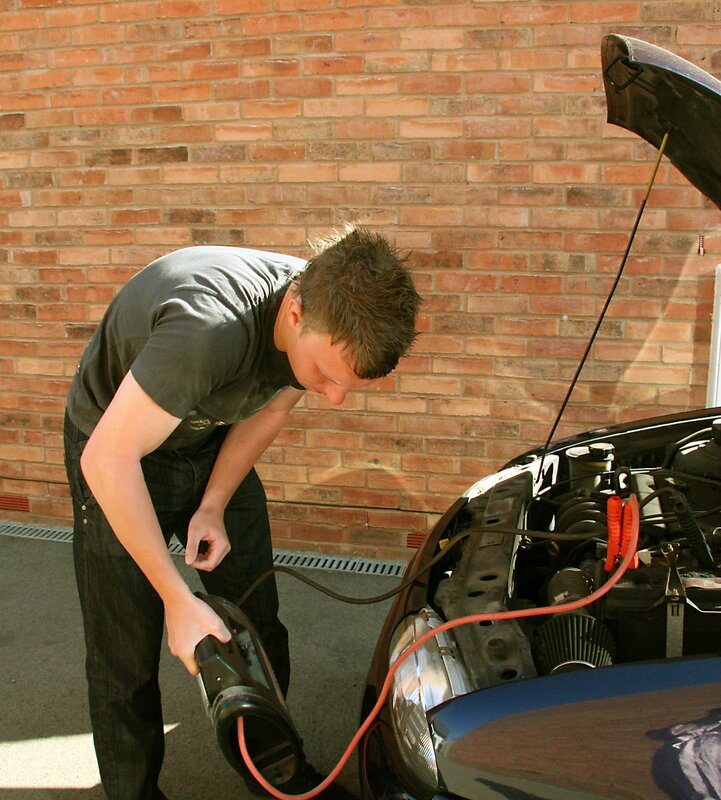 Jumper Cables – This necessity is fairly inexpensive and is available in different lengths. Mostly, they are between 10 and 20 feet. Most of the time, even the shortest 10-foot ones are more than long enough to connect the batteries of two different cars. While you might feel a temptation to go for the longest ones for the sake of convenience, the power has to go that much farther to charge your battery and may not be as effective. When you buy jumper cables, the gauge is what you want to pay attention to because this is what decides the power. The lower the number is that you will find on them, the thicker the cables will be, and this means that they can carry more power. Typically, the standard for a gauge size is 6, and this is right in line with what most cars need. Never forget safety – Jump starting a car is a pretty simple thing to do. That doesn’t mean that you can disregard safety during the procedure though. You are dealing with batteries and electrical equipment after all, so this means that you need to be cautious. First, you should read the owner’s manual for your car because some vehicles might have a jump start process that is a bit different from the norm, so it is best to know this before you start. Be careful with the cables and keep the metal clamps from touching, most especially after you have attached one end of them to the running battery terminal. Remember not to let anyone, especially young children, remain near the engine. You should keep yourself a little way from it too, due to the fact that is anything goes wrong, there might be a spark. Park the good Samaritan’s car so that it is facing your car with the hood close to the hood of your car. If the vehicles are automatic, put them in park. If one or both have a standard transmission, put that in neutral and set the emergency brake. Make sure the car with the good battery remains turned on. Open the hood on both vehicles and find the battery terminals. This is incredibly vital because you don’t want to accidentally connect the clamps on the jumper cables to the wrong terminal. Typically, the terminals will be marked with either a + or a – and be covered with black or red. However, batteries – like the rest of the engine, can get greasy and dirty. If you can’t see the markings, clean the terminals off with a rag first. Start with the red cable and attach its clamp to the battery terminal marked with a + in your vehicle and attach the other red clamp to the + terminal You might want to give that clamp a bit of a wiggle just to ensure that the connection is both tight and stable. Take the clamp on the black side of the jumper cables and attach it to the working vehicle’s negative terminal. Take the other end (the one by your vehicle) and attach it to any piece of unpainted metal that you can see in your engine. Now, just start your car and let it idle for a few minutes. It might take a few tries to get it started. Rev the engine of your car a few times to charge the battery. 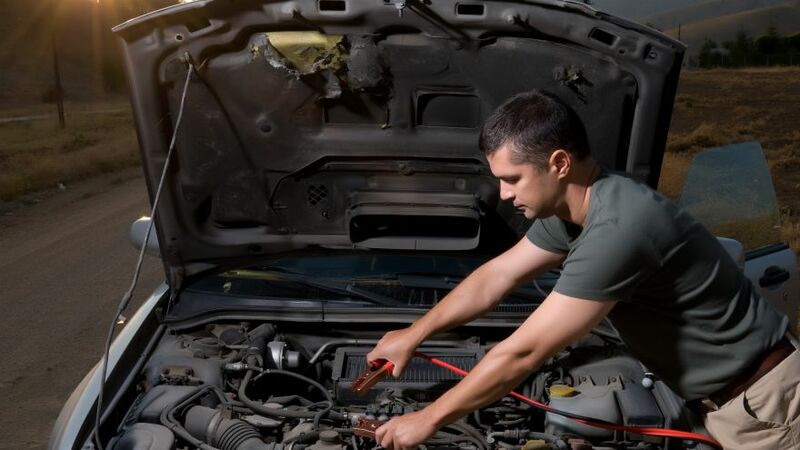 Once your car has started and is running, keep it running and remove the jumper cables clamp by clamp. Make sure that they don’t touch each other while they are still connected to either battery. Put them away in the trunk of your car. Take your car out for a short drive to make sure that the battery is charged. If the battery was dead for a significant amount of time, you might want to drive for a minimum of 20 minutes so that the battery can get enough of a charge that another jump start won’t be necessary. The thing about car batteries is that they always seem to die at the worst possible time. The only good thing about it is that it tends to be an easy fix… as you just read. Don’t freak out when your battery dies, it happens to all of us, and because of this, it might be easier to get help than you might think. Take a look around and see if there are any people around you. If there are, swallow your pride and trepidation and go ask them if they would be willing to jump your car off. This is not the time to be shy. Remember that the worst that could happen is them saying no. If nobody happens to be near you at the time, simply call a friend or relative who might be able to help. If they can’t or don’t have time right then, ask if they can give you a ride to where ever it is that you need to be. Remember that while you have your phone out, you don’t need to be visiting social media sites. You don’t want your phone battery to die while your car battery is dead. What do you do if no one is near you and you can’t get a friend or relative to jump your car off or give you a ride? Well, you might have to bite the bullet and call a pro. 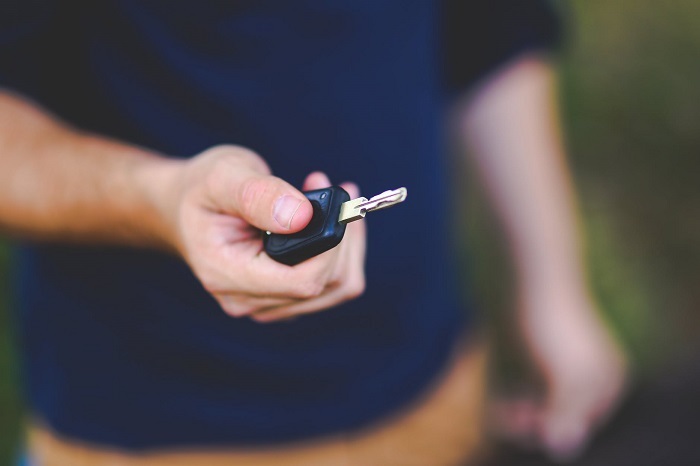 Depending on your car insurance, you may or may not have roadside assistance. If you do, call them for help. If you aren’t sure whether you have it or not, call your insurance agent and find out. If you don’t have roadside assistance, you will need to call a towing company. Most will send out a truck and give you a jump start for a fee. They will also be happy to tow your car to your mechanic. The mechanic can tell you whether you can get by with a simple jump start or if you need to replace the battery, or even whether it is an issue with the alternator. Most of the time, all you will need is a jump start. Once your battery has been brought back to life, a simple drive will be just what the doctor ordered to get it back to normal. However, if the battery continues to die, you might need to replace either the battery or the alternator. Here are a few tips to extend your car battery’s life and hopefully keep you from being in a position where you have to get a jump. Turn the radio off. When the car isn’t running, the radio can drain the battery quickly. Turn the lights off. Each and every time you get out of your car, make sure that your lights are off. If your car gives you the option for the lights to be on automatic, use it so that you won’t have to remember to turn them off every time. Also, make sure all of the doors are closed properly so that your interior lights go off as well. Pay attention to the weather. When it gets too cold, the limits of your battery can be tested, and this can lead to you having a dead battery. In the winter, try to run all of your errands at once so that you will be driving for a longer period of time. Starting the engine can be quite stressful to the battery in cold weather. Try to park the vehicle in the sun, and if you live in a place that is truly cold, think about getting the battery insulated. Pay attention to your battery. Check under the hood every once in a while, to see what the condition of the battery is. It is easy for corrosion to build up between and around the connectors of the battery and this can lead to inefficient operation. If you notice any sort of corrosion, simply scrape it away with a wire brush. As you can see, jump starting a car is not a really difficult thing to do. You should always carry jumper cables with you, and if you don’t want to bother anyone else with having to jump you off, you might even want to carry a battery charger with you. If the battery dies soon after you got it started again, or if it doesn’t charge at all, you might need to go ahead and replace it. Depending on the type, price, and quality of the battery, they can last up to 6 years. Lifewire– Why Does My Car Battery Keep Dying?